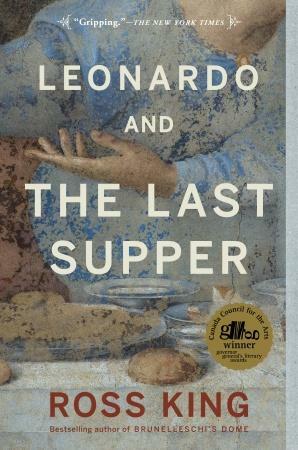 Ross King’s Leonardo and The Last Supper is a solid historical work on the artist and one of his most famous paintings. King does a good job setting the stage, by writing about the historical context in which da Vinci creates, as well as examining details of da Vinci’s distinct style and how it fit in within the larger context of art history. The Last Supper has been the subject of many other art works, and yet da Vinci’s version became iconic long before Dan Brown launched a new generation of conspiracy theorists. King does a good job in examining what set da Vinci’s version apart from all others, in terms of technique, form and treatment of subject matter. It is also interesting to get to know a bit of the man behind the work. Da Vinci has become such a cultural icon that it’s difficult to separate him from the mythos around him. King keeps the book firmly on the ground, and contextualizes da Vinci within his time, as well as paints a portrait of a man who is much more flawed than his “genius” moniker suggests. My only concern with this book is that despite the rich history it explores, the writing itself is very dry. The beginning seemed a bit slow, and snippets of really interesting observations seemed almost lost within paragraphs of detail. I wanted to love the book, and I did learn some interesting tidbits throughout, but unfortunately, it was just very, very slow-going for me. This entry was posted in Book Reviews and tagged 50BookPledge2013, Art, Non Fiction, Random House by Jaclyn. Bookmark the permalink.